While more than 300 bodies of African refugees were found off the shores of Lampedusa, German artist Hermann Josef Hack set up his WORLD CLIMATE REFUGEE CAMP made of model tents in St. Peter Square, Rome, on October 6. „The visit of Pope Franciscus I to the island of Lampedusa some months ago is an important symbol addressed to those who want to treat refugees like dangerous enemies, not like brothers and sisters who need our support,“ Hack declares to the media, „now it is up to the European governments to be active. As long as our governments continue dealing with corrupt dictators to increase their own profits, people of the effected regions will find their way across the Mediterranian Sea to escape their futile fate. Neither arming FRONTEX nor activating EUROSUR will avoid that in the long run. In contrast the conflict will deteriorate. 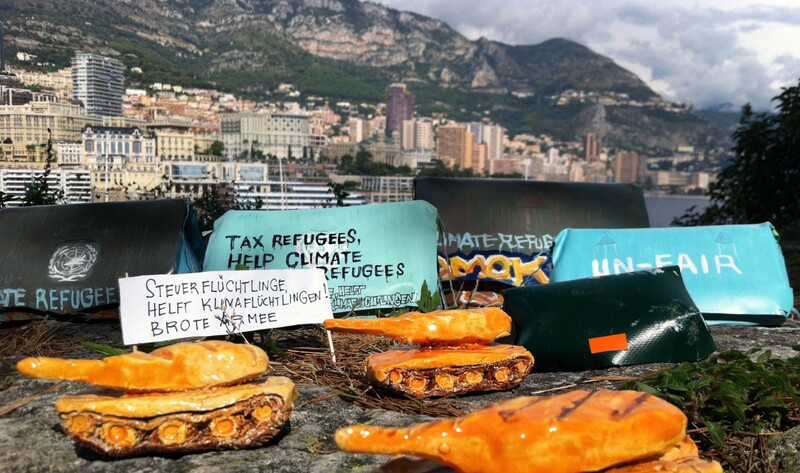 Touring around the Western Mediterranian Sea, Hack’s BREAD ARMY occupied the city of Monte Carlo, paradise of tax dodgers, with refugee tents and bread tanks. 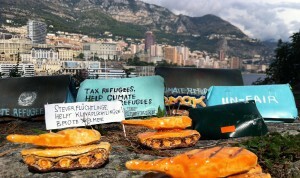 In front of the Grimaldi Palace and in the marina Hack reclaimed: „TAX REFUGEES (= tax evaders), HELP CLIMATE REFUGEES!“. 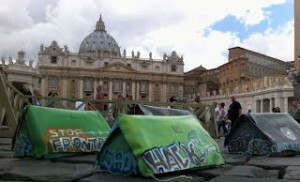 On Sunday, October 6, Hack placed his climate refugee camp in St. Peter Square in front of the domicile of Pope Franciscus. Hack pitched his camp also on Malta, Sicily, Corsica and in the City of Barcelona. The next station of Hack’s WORLD CLIMATE REFUGEE CAMP will be Puebla, Mexico, being part of the exhibition „Examples to follow“ www.z-n-e.de, opening October 17, Capilla del Arte UDLAP 2 Norte 6, Centro Histórico, Puebla. Exhibition 17.10.2013 to 19.01.2014.